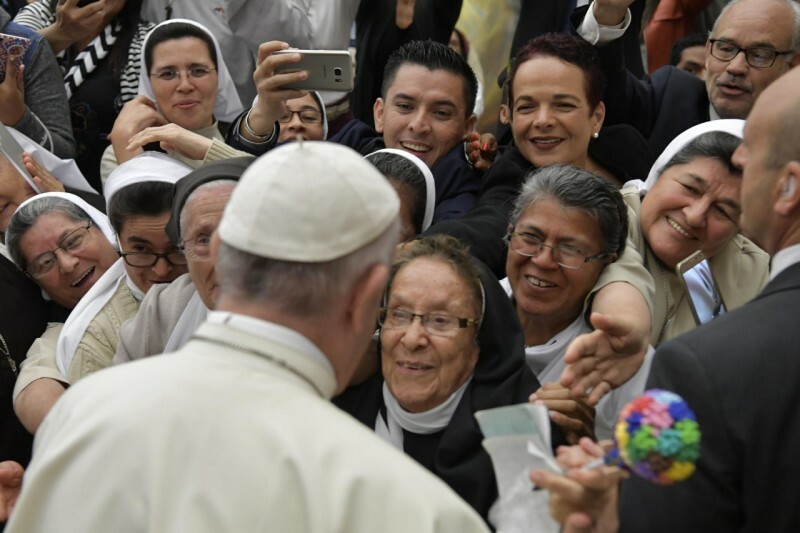 Pope Francis on October 15, 2018, received in Paul VI Hall the many pilgrims from El Salvador, in Rome for the canonization of Óscar Arnulfo Romero y Galdámez, which took place yesterday, Sunday 14 October, in Saint Peter’s Square. Good morning and thank you very much for being here. The canonization of Bishop Óscar Romero, a distinguished pastor of the American continent, allows me to meet with all of you who have come to Rome to venerate him and, at the same time, to express your attachment and closeness to the Successor of Peter. I greet in first of all my brothers in the Episcopate, the bishops of El Salvador, who have come to Rome accompanied by their priests and faithful. Saint Óscar Romero knew how to incarnate with perfection the image of the good Shepherd who gives his life for his sheep. Therefore, and even more so since his canonization, you can find in him an “example and a stimulus” in the ministry entrusted to you. An example of predilection for those most in need of God’s mercy and a stimulus to witness Christ’s love and care for the Church, knowing how to coordinate the action of each one of her members and collaborating with the other particular Churches with collegial affection. May the Saint Bishop Romero help you to be for all signs of that unity in the plurality that characterizes the holy People of God. I also greet with special affection the many priests and men and women religious present here. You, who feel called to live a Christian commitment inspired by the style of the new saint, become worthy of his teachings, being above all “servants of the priestly people”, in the vocation to which Jesus, the only and eternal priest, has called. Saint Óscar Romero saw the priest placed in the middle of two great abysses: that of the infinite mercy of God and that of the infinite misery of men (see Homily during the priestly ordination, December 10, 1977). Dear brothers, work tirelessly to give channel to that infinite longing of God to forgive men who repent of their misery, and to open the hearts of their brothers to the tenderness of God’s love, also through the prophetic denunciation of the evils of the world. I would also like to extend a cordial greeting to the numerous pilgrims who have come to Rome to participate in this canonization, from El Salvador and other Latin American countries. The message of Saint Óscar Romero is addressed to all without exception. He repeated strongly that every Catholic must be a martyr, because martyr means witness, that is, a witness of God’s message to men (see Homily on the First Sunday of Advent, 27 November 1977). God wants to be present in our lives, and calls us to announce His message of freedom to all humanity. Only in Him can we be free: free from sin, from evil, from hatred in our hearts, free to love and welcome the Lord and our brothers and sisters. A true freedom already on earth, which through care for the real man awakens in every heart the hope of salvation. We are well aware that this is not easy, which is why we need the support of prayer. We need to be united with God and in communion with the Church. Saint Óscar tells us that without God, and without the ministry of the Church, this is not possible. On one occasion, he referred to confirmation as to the “sacrament of martyrs” (Homily, 5 December 1977). And without “that force of the Holy Spirit, which the early Christians received from their bishops, from the Pope … they would not have stood the test of persecution; they would not have died for Christ” (ibid.). Let us bring to our prayer these prophetic words, asking God for His strength in the daily struggle so that, if necessary, “we too are willing to give our lives for Christ” (ibid.). From here I send my greeting to all the Holy People of God who are on pilgrimage in El Salvador and who are full of joy today at seeing one of their children in the honour of the altars. Its people have a living faith expressed in different forms of popular religiosity and that shapes their social and family life. However, the difficulties and the scourge of division and war have not been lacking; violence has been felt strongly in its recent history. A number of Salvadorans have had to leave their land looking for a better future. The memory of Saint Óscar Romero is an exceptional opportunity to send a message of peace and reconciliation to all the peoples of Latin America. Together with all of you, joining with your joy, I ask Mary, Queen of Peace, to take tender care of El Salvador, and our Lord to bless His people with the caress of His mercy. And, please, do not forget to pray for me. Thank you.